Be the first to share your favorite memory, photo or story of Agatha. This memorial page is dedicated for family, friends and future generations to celebrate the life of their loved one. Minister Agatha Roberts Hester, 77, died April 11, 2019 in Colorado Springs, Colorado. She was born May 8, 1941 in Atlanta, Georgia, daughter of the late Rev. James A. Roberts, Sr. and Mrs. Beatrice (Williams) Roberts. 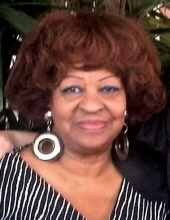 Agatha graduated from Tennessee State in 1962, majoring in piano music and voice. She then attended the University of Florida A&M and received a Masters degree in music and ministerial studies. She was a dedicated teacher of music, bible studies and single's groups. Agatha was a member of the Delta Sigma Theta sorority and the Potter's House Church of Denver. She is preceded in death by her brother, James Roberts, Jr.; her grandson, Kyhon Hester; and her parents. Agatha is survived by her two daughters, Lisa and Katie Hester; son, Lance Hester; two sisters, Suzanne Foster and Sarah Roberts; three grandsons, Landis Hester, Malachi Hester Peterson and Lance Hester, Jr.; three granddaughters, Tyra Shae Coleman, Neveah Hester and Emma Hester; along with great-grandchildren and a host of nieces and nephews. Visitation, 4:00PM-8:00PM, Wednesday, April 24, 2019, The Springs Funeral Services, 3115 East Platte Avenue, Colorado Springs, Colorado 80909. Funeral Service, 2:00PM, Thursday, April 25, 2019, Church For All Nations-North Campus, 6540 Templeton Gap Road, Colorado Springs, Colorado 80923. To send flowers or a remembrance gift to the family of Agatha Roberts Hester, please visit our Tribute Store. Guaranteed delivery before Agatha's visitation begins. Guaranteed delivery before Agatha's funeral service begins. "Email Address" would like to share the life celebration of Agatha Roberts Hester. Click on the "link" to go to share a favorite memory or leave a condolence message for the family.